When I did many of the travels in this site, I also did all my own Christmas Cards. It’s really easy to do with digital photos and PowerPoint. But the challenge was to find the right pictures. The ones I like best are mountain settings with lots of snow, and a well placed church. 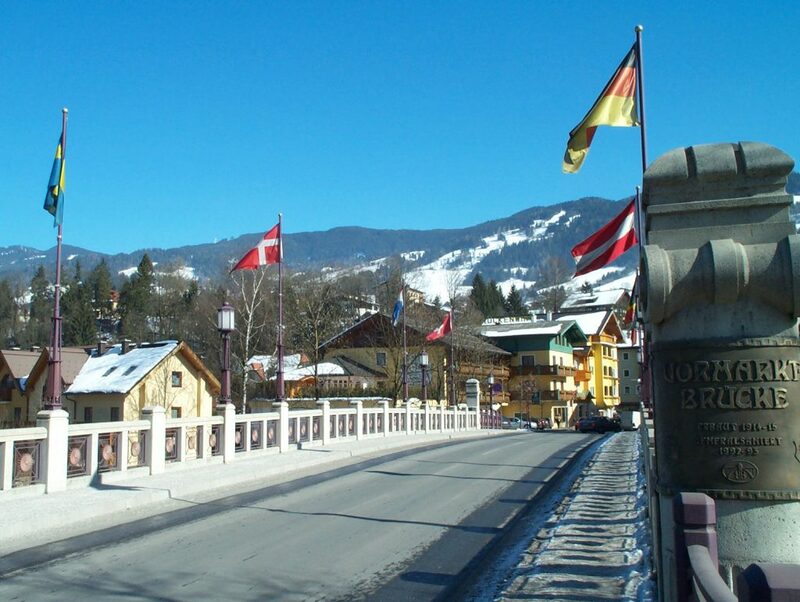 Something like the photos shown here of the Salzach River town of St. Johann im Pongau. Indeed, I went to St. Johann and a couple of its neighboring towns during the late fall, with the primary purpose of collecting potential Christmas card photographs. Unlike the lower Alpine valleys in Germany that tend to get fogged in sometimes, the upper valleys of south central Austria always had blue skies when I went, and it only takes a little bit of mountain goating to get great overhead views. But enough about Christmas cards, St. Johann is a beautiful town all by itself, and a great place to go if you are snow bunny. 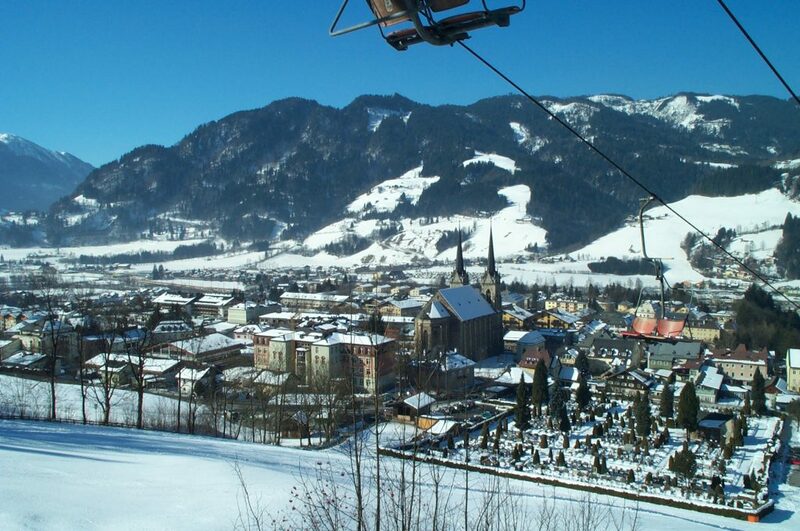 St. Johann has two halves — the lower town that snakes along the Salzach River toward Salzburg, and the upper town sitting on a plateau about twenty meters above. The lower town is much newer, probably indicating that the waters of Salzach River have been tamed over time. Following along the Industriestrasse north from the train station, a number of new shopping centers have sprung up on the western bank, and the residential neighborhoods looked new. Where you want to go is to the upper town over the east bank. So, my suggestion would be to head south about a hundred meters or so to reach the Vormarkt Brucke (below) and cross the river. The east bank has a pleasant river walk and the Tauern Radweg bike trail. This trail extends along the Salzach through much of the Salzburger province and is supposedly a great bike ride in the summertime. Also, below a major Austrian military kaserne is the Salzachpromenade that would probably be full with outdoor cafés on a warm summer day. Getting to the upper town was as simple as going back to the Vormarkt Brucke and following the Hauptstrasse. Sounds easy, but the darn road was about a ten-degree incline the whole way! By the way, I could not see the upper town from the river due to the trees, so until I got up top I knew not what to expect. What I found was a village that clearly catered to skiiers and snowboarders. 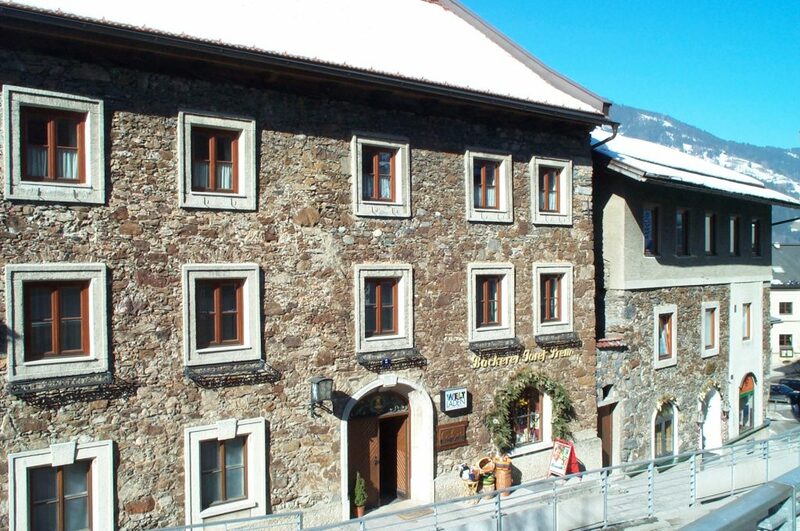 The third photo shows the main street, lined on both sides of the road by large ski and winter sport shops, large guesthouses, and restaurants. Off the photo to the right were some especially large complexes with huge buffets and bright, elaborate exterior decor. The parking lot adjacent to it has spots for thirty buses. I suspected that this town was indeed doing very well in the winter. And no wonder! What I would learn was that a major ski runs actually ends in the dead center of town! I continued uphill hoping to get my winter pics, and followed the zigzagging roads to the east where several (probably expensive) residential neighborhoods resided. I made my way up Wagrainer Strasse to a side road called the Hubangerl, when I noticed a seilbahn (ski lift) going directly over the roadway. Then, I watched as skiiers went directly across the road, very fast. A car passed by me and upon reaching the ski crossing, stopped, waited for another skiier to pass, then continued driving. Reaching the crossing point myself I noticed a yellow road sign with a symbol clearly meaning “Watch Out for the Skiiers”, and that the stretch of road was clearly iced over on purpose. Somehow, I wondered if such an arrangement would be possible in the US (e-mail me if you know). It was from that general area that I produced the great panorama in the first photo, and the shot below of a skiier heading for the bottom. In both shots, you can make out the friedhof (cemetary). 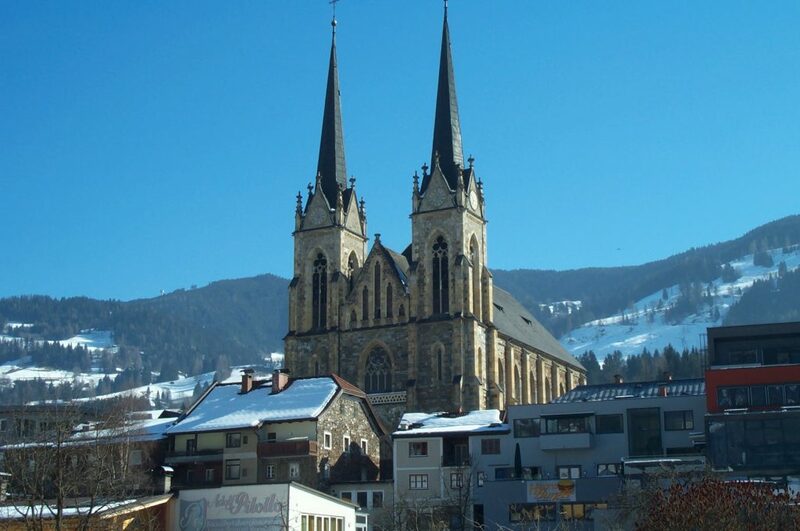 In the first photo, you also see St. Johann’s most prominent structure, the Pfarrkirche. The final photo shows the Pfarrkirche up close. I didn’t find very many “old” buildings in the downtown, and those I did find looked like they’d been rebuilt, perhaps after war damage or simply too many harsh winters. The Pfarrkirche’s interior was a brilliant white with beautiful red brick trim and some lovely artwork, but the exterior showed a lot of scars. The bakery across the street from it (the hexagonal building in the fifth photo below the church’s front door), looks half 17th century and half three decades ago rebuild. However, several buildings have old, largely unretouched (therefore slightly faded) murals on their outer walls that depict mostly war propaganda (scenes of soldiers carrying the Austrian flag being welcomed home and that sort of thing). 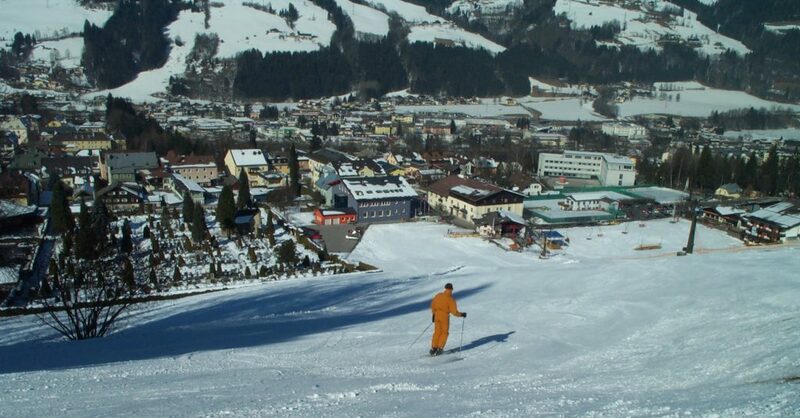 While it clearly caters to the ski season, St. Johann also has activities in the summer. The previously mentioned Tauern-Radweg is great for bikers. The mountains have many hiking trails. And about two miles south of town is the Liechtensteinklamm, a very steep, rocky natural gorge that is only open from May to October. And then there are all those wonderful shops and guesthouses to visit — my lunch was absolutely fantastic. So, my visit to St. Johann was a total success. I got several great Christmas card shots, and discovered a great little town that previous I’d never heard of. That’s what makes this hobby so rewarding!